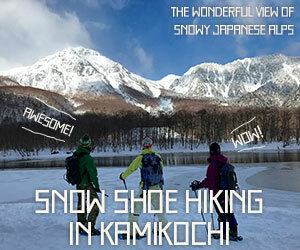 Guesthouse Raicho is holding Snowshoeing tour for guests to see the beautiful winter view. When we see the beautiful nature in the snow and ice falls it will make us peaceful heart. And after tour, “Onsen” is waiting for us. We can relieve our tiredness. ・Night snow shoeing tour to Zengorou fall :1000yen per person. Guide will light up ice fall and you can be impressive. Zengorou fall, Ushidome pond and Ichinose Enchi for 3 to 4 hours. We take a ski lift and go to Sanbon waterfall, Ushidome pond and Zengorou fall or Ichinose Enchi for 6hours. ・Kmikochi 1day tour　:10000円 per person. For detail, please see the below. There are many activity in Winter season in here Norikura kogen. For detail, Please check below post too.